The Dow is going to break its bear market trend line today. 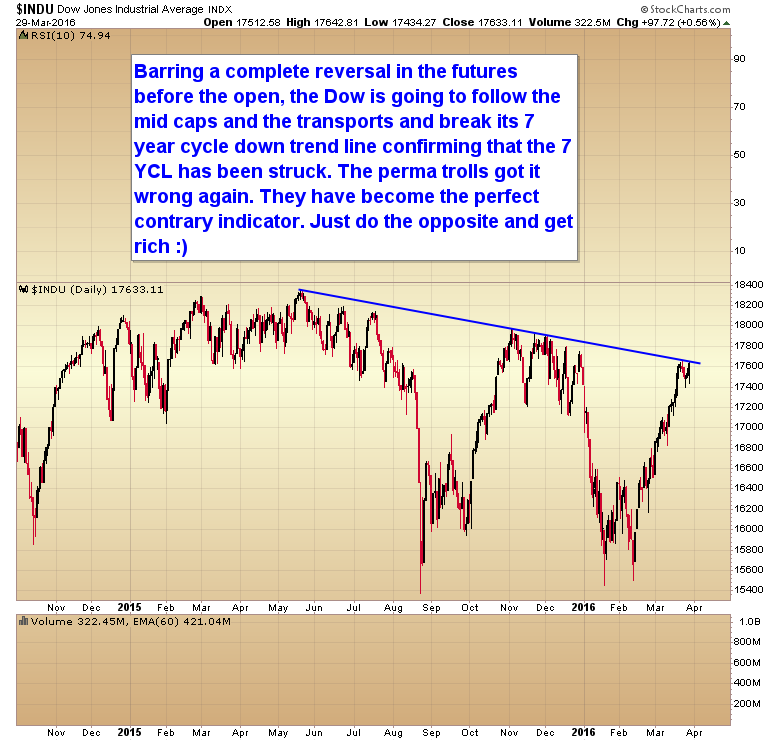 This has significant implications for the future direction of the stock market indexes. You would think the law of averages would allow the trolls to get one trade right every now and then, but so far they are batting 1000. What I want to see is if Dan is man enough to go on the Kereport and admit he was wrong and I was right. I did it when I was early to the oil trade. Came right out and said I missed it. Not let’s see if Dan can do the same. I’m betting he will stay bearish all the way up and we’ll never see that retraction. Congratulations, Gary, on a series of great calls. When would you expect the next significant SM correction, in May, perhaps? A top in May, and the next ICL would be due in June or July. However if a runaway move gets started there’s no telling when the next ICL could happen. Runaways can stretch cycle lengths. Another broad brush smear that ignores proven money making bearish strategies over the past two years. I don’t care about losing small in OTM options, it comes with the territory. I had a monster year last in 2015 staying always at least 85% cash. What I hate more is this smug parasitic attitude that supports the corrupt central bank system. You think you’re so smart staying long a corrupt ponzi that punishes savers and debt profligacy. Guess what, the broad market has still gone nowhere since late 2013. Your lecturing posts and attitude don’t help either. I just want you to make a public statement on the Kereport that you were wrong and that I was right. You have bashed me mercilessly over there now that Al prevents me from posting. If I can admit when I was wrong I expect you to do the same. And yes of course the PPT has stopped the bear market. I did a whole article on market manipulation and tried to educate people on how to use it to make money instead of pretend it isn’t there like that nitwit Gilbert. OTM options 99% of the time those options expire worthless, if you make any money in OTM option plays its pure luck, so I have my doubts on your 85% return without some sort of proof…. Tell Al that is attitude is completely wrong,and this from someone who likes that blog/site a lot! theres some weird psychology going on at ker..
mostly al..who imo is very insecure. v offensive remarks to Gary.. Gary was quite calm. Bullies pile on the smart kid mentality…theres much babbling over there. al has an agenda…..besides his agenda….he is very limited in his views. The sole person who was publicly conciliatory towards Gary was Jay Taylor. Still bearish, still 98% cash, still not chasing. Waiting until the end of the second quarter, to see if this is bubble phase or just another bear market rally. Spy into resistance and biotechs and financials near lows doesn’t make you right yet. Seasonality just went up a big notch…. Dan — Man up and stop being a little B*tch 🙂 Or else the Muffin’s coming after you, haha! I haven’t even taken a third of my bearish volatility bet yet and I’m suppose to admit im wrong? I will post when I buy. You act like ive been short since Feb lows. Anyways, enough for today. Troll on bubble phasers. Talk about a troll, you take the cake Danny. Another doomer goes up in flames…..
After 4 years of thinking gold has to go up and fighting the SM, no way am I going against Gary on this one. Been there done with that disaster. It’s getting a little emotional here – not needed, in my view. Great call Gary on the bottom of Gold; super job. On the conventional market: I think the jury is still out on whether we have seen the 7YCL. It appears to me that all the manipulation of what you call the PPT e.a. may have stretched the cycle. If this is the case, would it still be possible to get a crash at this very top or in the next few months? Don’t crashes happen when everybody believes the opposite and thinks it’s ‘good ol’ bull times again’, more QE and more free money? Breaking the multi-year cycle down trend line is big big confirmation that the 7 YCL is complete. Was out messing around and having fun yesterday so still didn’t get my XBI, perhaps I’ll buy it later this morning. Holy crap Ralph! D’you need me to hack into your account and buy it for you?!! No. We are at a critical spot. If higher yields fail here, i.e. 5’s 1.3% and 10’s 1.875%, yields will be heading lower quickly. You’ve had a great run, Gary. I’m onboard with you. I don’t follow what these guys are doing to and saying about you on other websites, but when you lambaste them as idiots, you open yourself up to major attacks if you go on a cold streak. That being said, I enjoy reading your work and you are the main reason I’m in the IBB in a big way from these levels. I endured 2 years of attacks over at Kereport. Most of the time the trolls just made up crap that I never even said. For what ever reason Al refused to block the trolls. So I’m just getting a little payback. I’ve been frustrated with them too…. seems they are dismissive of clear evidence of market manipulation, instead of investigating. At the same time, I think it’s worth giving Al a little grace, despite frustrating things he’s done. He’s had a stroke in the last year or so and either he or his wife are on dialysis (which I know from experience is an extremely stressful thing for a family). It doesn’t excuse any unfairness or ill treatment of Gary, or anyone else, but we never know all that’s going on in someone else’s life and the duress they’re under, so maybe we should cut him some slack and give him some grace. Good to hear Gary. It’s very clear that trading with cycles is much more effective in the present day than buying breakouts and selling breakdowns. Combining your work with some things like Wolfe Waves and forks has helped me to have higher conviction in trades that line up with my criteria. Thanks again. My gripe wasn’t so much with Al, although he refused to get rid of the trolls, It started with Gilbert, Then once I left I started hearing Chris take sideways shots at my cycles work and then even Doc started to take shots when he would miss calls and I was right. Rick has been a stand up guy all along, he’s just a perma bear. Cory as well has been a perfect gentleman. oh cmon… C Temple spoofs the nitwit gilbert as well…. Markets waiting for the weekly oil report 10:30 this morning, if oil shoots up, the SPX uptrend will move heavy.. The reaction was good, but not that smashing, still a chance to break 40, this I guess will push SPX higher. Charles Evans, president of the Federal Reserve Bank of Chicago and a nonvoting member of the policymaking committee, said Wednesday he did not anticipate a hike this month because inflation remains low. Dow 18,000 or bust by May? EUR/USD expressing its desire to get higher. Will it break above resistance soon? When that happens, it could run fast. Gold’s action today is a bit surprising. no way. It will come back with a vengeance. This is the last kiss goodbye. 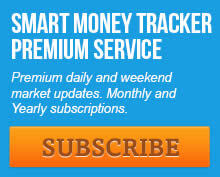 A shyster who pays reputable web sites such as MarketWatch to run his ads disguised as journalism. “I’ve been correct on my intermediate calls and macro calls over and over” C’mon Gary, that is an exaggeration and you know it. You have gotten SOME calls correct and a whole lot of incorrect ones. One only has to read your blog back a few years to confirm that. Your batting average was so bad in 2013-2014 that I almost gave up on you. Some of your better calls have been made very recently when you correctly identified a bottom for gold and also for the SPY. Your strong stance on a coming biotech bubble and sustainable breakout for the S&P , if it all plays out as you predict, would be proof that you have finally got it together. BTW, please resist the temptation to make the sort of cheap and useless calls of ‘it might go up or it might go down’ sort of nonsense. That is a favorite trick used by AVI (and others) so that they can always claim credit for ‘getting it right’. Heck all the way back in late 2103 I was saying the Nasdaq was going to test the all-time highs. This while Doc and Rick and the usual perma bears were trying to pick a top all the way up. And I don’t make if then calls. I make directional calls and trade them in real time in the model portfolios.